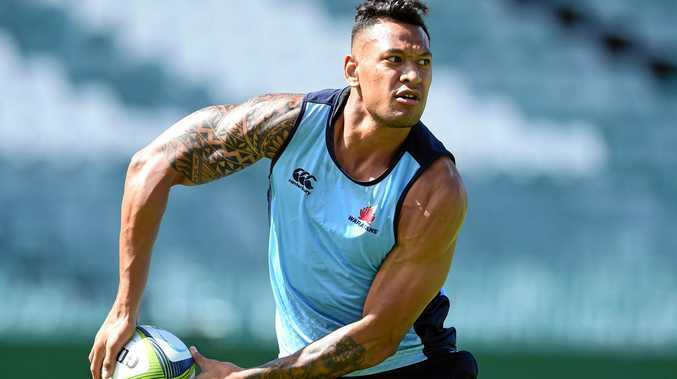 RUGBY UNION: Waratahs coach Daryl Gibson has shaken up his underperforming starting line-up for the crunch derby against the Melbourne Rebels. Bernard Foley (concussion) has been named to make his return in the No.10 jersey and will be partnered by rising halfback Jake Gordon. Gordon replaces out-of-sorts Wallabies No.9 Nick Phipps, while in a surprise move Israel Folau has been moved from outside centre back to fullback. That switch sees Andrew Kellaway named on the wing, while David Horwitz and Rob Horne form a new midfield pairing with youngster Irae Simone omitted. In the forward pack, lock Ned Hanigan has been rewarded with a start at blindside flanker following the serious injury to Jack Dempsey. "We need to get our combinations clicking,” Gibson said with the Waratahs languishing with just one win from four starts. "Up until now we have been far too inconsistent and the mistakes have been on us to fix. "We are pleased to have Bernard back, his absence has certainly been felt in those first four rounds. "For Jake it is an opportunity as a promising young player and he deserves a chance. "Jake's got an eye for a gap, he's a strong runner, he plays a lot on instincts and he is a good kicker of the ball. "Ned came on and made a nice impact (last week). "He has always been past his age group, (and at No) 6 or 4 he is a very versatile player. "I like what he brings to the team. He has got immense ability and it is a good opportunity on a bigger stage to really cement himself. "The short turnaround I think has been good for us this week on the back of Saturday night's loss. "The team came in Monday eager to do what needs to be done to get us out where we are right now. "The Melbourne Rebels won't be an easy side to face at home and certainly they were unlucky to get the loss they did last week.